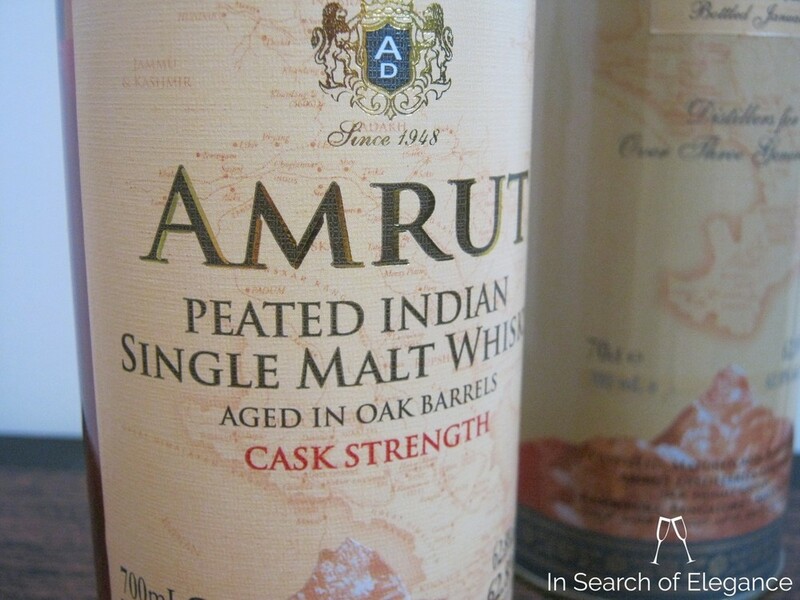 A fully peated, cask strength whisky, from Amrut. They also offer another version at 46%. All the barley in this whisky is from Scotland, peated to 23 ppm. Woody, floral (in a dried flower sort of way), vegetal, and peaty with dried fruit and caramel- quite an interesting one here weaving together some very interesting flavor camps. Strong peppermint (like candycanes) too, alongside the rich oakiness. The mintiness, is, in fact, almost like the menthol-like nature of freshly milled green cardamom when amidst the various spices here. But of course we have so much more: dried apricot, dried pear, dried hibiscus, apple seeds, apple sauce, and almost a general mixed bag of spices that all meld together – cloves, cinnamon, saffron (particularly), black peppercorns…This isn't aged long but feels as though it is full of fabulous age - that Indian climate certainly does its work! Not overly peaty, though the earthiness and light smoke are certainly around, especially towards the end of the palate. Complex, interesting, and very nice. With water, it grows a bit, and apple emerges more fully....but I like this one at full strength more. A winner. Exceptional (3% of whiskies I’ve reviewed to date receive this, my highest recommendation). One of my all time favourite whiskies. Value: Very high. 107$ for this is incredibly worthwhile. Recently at the airport, and I was debating between picking up batch 28 or batch 35. There was a remarkable difference in colour – 35 was much lighter. Wasn’t sure if I wanted to roll the dice with perhaps a more cask influenced bottling, but I decided to - given how much I loved the oaky intermediate sherry earlier this year. I was intent on buying another to see if there was more peat influence. A dense, rich, gorgeous nose. Woody and tropical and slightly floral: Leather, heather flowers, lavender, dried peach, dried apricot, dried papaya, light sweet smoke (wood smoke/char rather than vegetal peat smoke), custard. The palate is quite smoky, and rich – fire roasted chickpeas, lots of dried fruit, oak – ever so slightly astringent, in a good way -tannins and tobacco play in lightly. Finish is lightly smoky, vegetal, dry – still lots of tropical fruit and dried fruit. There’s a growing richness and smokiness, a flourish of spice, and I get some more tobacco oils (like the finish of a good cigar, a few hours after it has been smoked). Very Highly Recommended (18% of all whiskies I’ve reviewed to date get this recommendation or higher). Not quite the last batch, but nearly there, and on the edge of the highest recommendation category.